The double action on this gun reminds me of a good wheel gun. Is it me, or the guy from the video sounds JUST like Nicholas Cage? Also the reviewer failed to mention that you can take out the assinine decocker and put in a standard thumb safety for SA use. Speak for yourself, I like the de-cocker for carry reasons. +1 for decocker instead of "safety"! And a 'frame rail for your tac-light or pistol bayonet'. Nice. That pistol bayonet sounds like a must-have, Homer Simpson kind of item. I love my P07 Duty. I gave one to my grandson and he thinks that he's died & gone to heaven. What, no one posted hickok45's video of the P07!?! Oh man, oh man, do I ever love my P07 in 40. I own both an SP-01 and the P07. The ergonomics are completely different, both very nice, but to me the P07 feels slightly better. It really does have a great feel and balance to it. I bought my first CZ a couple of weeks ago. I had been reading the reviews and found them to be mostly mixed but overall good. I have a Glock 19 but it is not my favorite. My two favorites are my Steyr M9-A1 and my Sig Saur P226 MK25. The Steyr is my favorite shooting handgun but it does throw a casing at my face and neck on occasion. But I never fail to hit the target exactly where I point it. 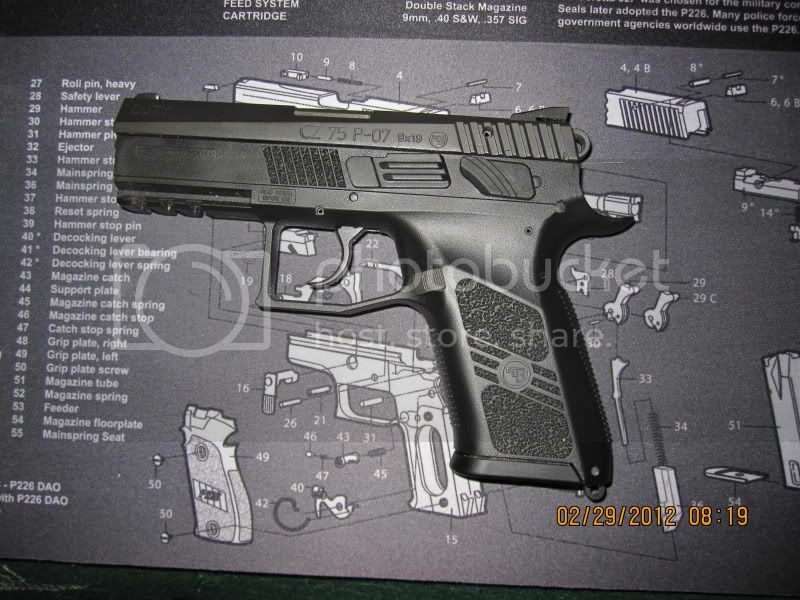 I quickly put about 300 rounds through the CZ P-07 and feel just as comfortable with its accuracy and feel as the Steyr. I think that in the future it will either be a CZ day or a Steyr day. The Sig is fantastic but heavy with some outfits and may be too bulky in the Texas summer heat with light short sleeves and polo shirts. Has anyone removed the lanyard holder on the bottom? Thinking about it. I rarely sell my firearms (the one exception was my Walther PPK/S). It just hurt my hand after 50-100 rounds and I refuse to carry something that I don't feel 100% comfortable with shooting. I have Arthritis in my thumbs and the PPK/S just beat me up too much and even left a scab. All in all; I prefer the ergonomics of the CZ and put it in the same class as the Steyr (well, close anyway). BTW- every holster I have for the FNX-9 also fits the CZ P-07 9mm so when you search for the CZ P-07 comes up blank ....try the FNX-9 but save your receipt just in case it doesn't. Just adding another video review. Nice videos. Even that last one. Nutnfancy makes good videos, just wish he had tried a 9mm P07. Video is kind of old to. I had more issues with my G19 in the 3 months that I owned than I have ever had with the 07. Granted it was only 2, but 0 still beats 2 in this case.